Inducted 1998. Went 52-7 as Softball Pitcher, Helped QND Win 1981 State Title. Looten helped Quincy Notre Dame’s softball dynasty of the 1980s get started when she pitched the 1981 team to its first of three single-class state softball championships in the decade. She then went on to help establish the Quincy College softball team as one of the country’s best in the mid 1980s. Looten was the winning pitcher in the 1981 state title game and was chosen as the most valuable player of the tournament. She finished her career with a 52-7 record as a pitcher and a miniscule 0.72 earned run average, which is remarkably only the fifth-best career ERA in school history. She pitched 50 complete games and tossed 18 shutouts, and in 343 innings pitched, she walked just 35 while striking out 236. She also finished with a .401 career batting average. Looten helped pitch Quincy College to a second place finish in the 1984 NAIA national tournament, and she was named to the CoSIDA Academic All-America team that season. 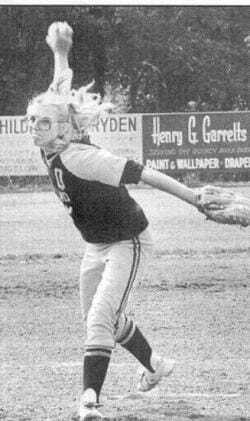 She was 30-7 in 1984 with a 0.65 earned run average and a school-record 13 shutout victories. In pitching a school-record 258 1 /3 innings that season, she walked just four batters, also a school record. She holds career records at QU for victories (64), earned run average (0.96), fewest runs allowed (128) and fewest walks allowed (22), as well as 31 career shutouts. She is second all-time with 188 strikeouts in a season. QC had a 79-34 record during Looten’s career, including two NAIA District 20 championships. The 41 victories QC recorded in 1984 are still a school record. Looten was inducted into the Quincy University Sports Hall of Fame in 1994. She is the public relations director for Culver-Stockton College in Canton, Mo. She lives in Quincy with her husband Steve and her sons Steve Jr. and Danny.